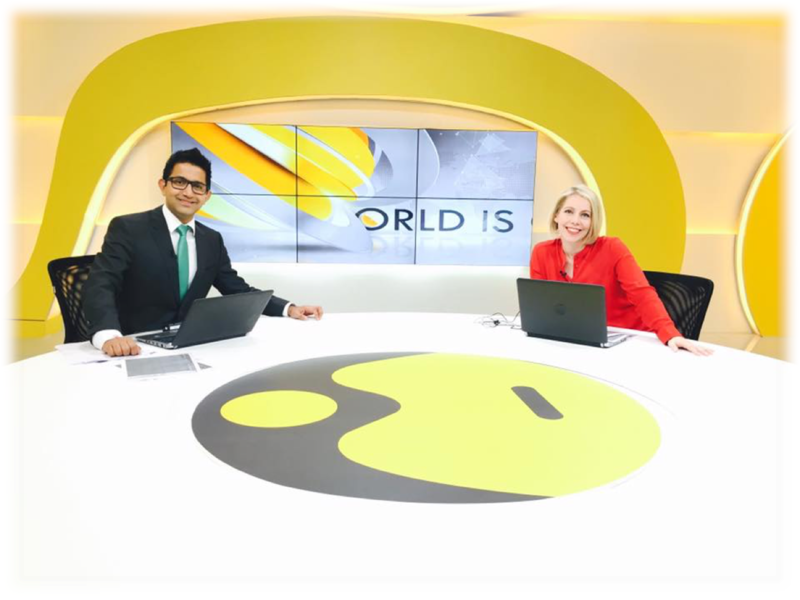 Dalet Digital Media Systems today announced that World Is One News (WION), the youngest venture of Zee Media Corporation, launched WION underpinned by Dalet Unified News Operations. The Dalet solution is powering and supporting the international news channel with comprehensive media logistics, newsroom computer system and news production workflow facilitated by the Dalet Galaxy Media Asset Management (MAM) and orchestration platform, with full ingest and playout operations relying on Dalet Brio video servers. Dalet Digital Media Systems, a leading provider of software-based solutions for media organizations, today announced that World Is One News (WION), the youngest venture of Zee Media Corporation, launched WION underpinned by Dalet Unified News Operations. The Dalet solution is powering and supporting the international news channel with comprehensive media logistics, newsroom computer system and news production workflow facilitated by the Dalet Galaxy Media Asset Management (MAM) and orchestration platform, with full ingest and playout operations relying on Dalet Brio video servers. WION delivers path-breaking news coverage from across the globe with a South Asian perspective to international audiences across the web, mobile devices and TV. Operated by Zee Media Corporation with headquarters in India and bureaus in 37 global locations, WION is the first India-based network to have a presence in the U.K., U.S., China, Russia and Africa, making it South Asia’s first truly convergent, multi-media English news network. WION is the first broadcaster in India to deploy the Dalet Galaxy-based Unified News Operations workflow. Easy-to-use production tools via web-based Dalet WebSpace and relevant story content are readily available to every user in the newsroom and in the field. When WION journalists receive a notification about an assignment, they can search, browse and access every asset in the Dalet platform from their desktop, laptop or mobile device, whether it is news wires and footage that just came in, or existing stories and video packages. Beyond the walls of the newsroom, WION journalists use the Dalet On-the-Go mobile app to check assignments and create packages, exporting content to the CMS, as well as to YouTube, Facebook and Twitter. Video and scripts can be logged and edited within Dalet OneCut, or sent to Adobe Premiere via Dalet Xtend for craft editing. Media and associated metadata are tracked and managed by Dalet Galaxy every step of the way, including playlist export and import to and from the CMS. Once approved by a producer, final content is readily available for use in the built-in production control room automation and exported to the CMS as a multimedia story object. Beyond the comprehensive set of tools and services natively built into Dalet Galaxy, the advanced web-services API integrates and unifies the full ecosystem of technologies and in-house tools used at Zee WION, including the custom CMS based on Kentico that drives workflows within the Dalet solution. Other integrations include WINBDL teleprompter, WASP graphics system and Quantum SNFS with NetApp E series storage. Where does Dalet OneCut sit in the Dalet ecosystem and in the news production workflow? One of our key focuses at Dalet is to offer true unified news operations for news organizations. As part of this mission, we have developed a powerful, multimedia editing tool for journalists and storytellers: Dalet OneCut. How is Dalet OneCut different from other editing tools out there? In developing Dalet OneCut, our goal was to pinpoint the functionality storytellers, like journalists, needed most. We designed Dalet OneCut to be a simple-to-use editor that focused on their needs specifically. This allows them to efficiently and creatively produce their stories. The new release of Dalet OneCut, which we will be showcasing at IBC2018, includes a standalone version that incorporates the same exact features as the Dalet OneCut that today serves thousands of users within the Dalet Galaxy five environment. If a user is familiar with the connected Dalet Galaxy five version of OneCut, there is no additional training needed to edit their piece in the field or on-premise in the newsroom. The consistency of workflows between in-the-field and on-premise operations is a big advantage for users as they don’t have to sacrifice any features to work remotely. What hurdles do journalists face today in preparing their news packages? We have received several requests from news organizations looking for us to provide a seamless way for journalists to contribute content from the field with the ability to finish or partially finish their story remotely. Previously, there was no efficient way for journalists in the field to easily access and use the newsroom’s central content catalog to prepare their news packages and deliver these back to the newsroom. With Dalet OneCut, we solved two things. First, we give journalists a way to quickly upload content from the field. Second, we give them the ability to share story drafts as well as finalize and submit their piece from anywhere, using content they captured in the field as well as content from the central newsroom catalog and archives. When a journalist does submit a story, whether it is work-in-progress or complete, Dalet OneCut knows to only upload the locally captured media used in the package, while Dalet Galaxy five on the receiving end links the on-premise content when the package is received. Not having to move all of the local and on-premise media files back and forth saves an enormous amount of time and resources. And with a direct link to their Dalet Galaxy five environment through Dalet OneCut, journalists can render straight to a placeholder, which is important for airing fast-breaking news. No other remote editing workflow has this type of flexibility. What hurdles do news broadcasters face when supporting journalists in the field? For broadcasters, there is a big IT challenge to set up remote workflows. Remote connection requires VPN licensing, added security, and dedicated infrastructure to set up properly. In Dalet remote editing workflows, we leverage the cloud to address many of these issues. Dalet OneCut in the field and Dalet Galaxy five utilize intermediate media that is located on the cloud. Journalists are not actually connecting directly to the on-premise Dalet Galaxy five environment, and this eliminates security issues. The overhead is minimal, there is no need for a VPN or any VDI-like connection. Keeping costs under control ticks off an important box for broadcasters. You are showing the new Dalet Remote Editing multimedia content production tool at IBC - what are the cool features and capabilities attendees should see? In terms of Dalet OneCut editing improvements, we will be showing multiple video layers and graphics tracks that journalists have been requesting. We’ll be showing the redesigned effects palette, which provides a simplified approach to creating effects. Users can do simple or advanced boxing with positioning, scale, video rotation, cropping and feathering on multiple layers. We have also added simplified keyframing for adding effects, and users can now easily overlay text in Dalet OneCut. In terms of remote editing specifically, of course we will show our creation of MPEG-DASH, either locally or on the cloud, on S3. We will show the ability to edit remote content directly out of S3, while smartly downloading only the portion that I want to have on my timeline so I can continue editing from that file, even if the network connection is unstable. We will also show how you can cut 10 seconds from an hour-long file, then smartly download only the 10 seconds of media that is needed; create a voiceover, finalize the piece, and then send back to the site to be rendered on-premise/in the newsroom. The entire team has been working really hard on these remote workflow innovations. We first showcased it in private presentations to a number of beta customers and personally, I'm really excited to showcase it publicly at IBC2018!